Looking for commercial invoice templates? We've got you covered! Do I need more than just a commercial invoice template? Commercial invoices are frequently needed when you need to ship something overseas, which means you need a commercial invoice template that is simple enough to be easily inspected, but that doesn't lose out on some style. Luckily, ZipBooks has commercial invoice templates that have a clean, fresh, professional design that even allow you to put your company's logo at the top. Then you can save it so you don't have to create a new invoice template every single time. Check out what else our invoice templates can do. 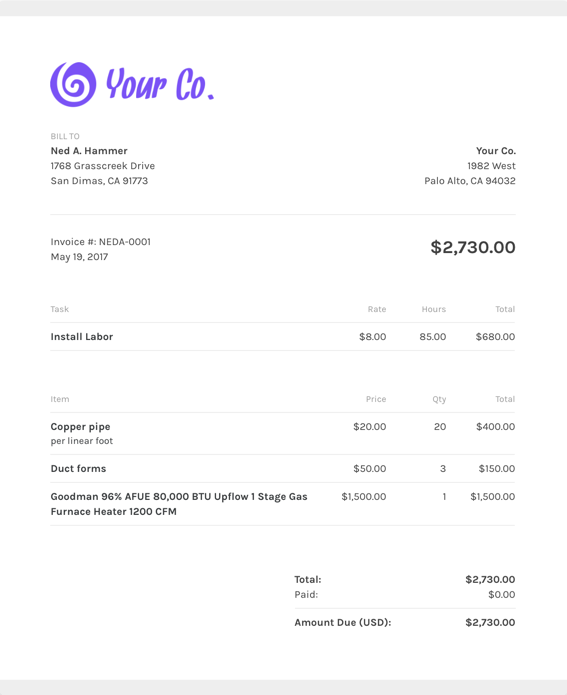 What should I include on my commercial invoice template? One awesome feature that ZipBooks is that you can save default settings for your invoices once you nail down the invoice details. Using ZipBooks for your commercial invoice never forgetting to include critical information. We’ve collected data from tens of thousands of invoices and use it to score your invoice based on what information you include so you’ll get you paid faster. Why should I use ZipBooks’ commercial invoice template to create and send my commercial invoice?